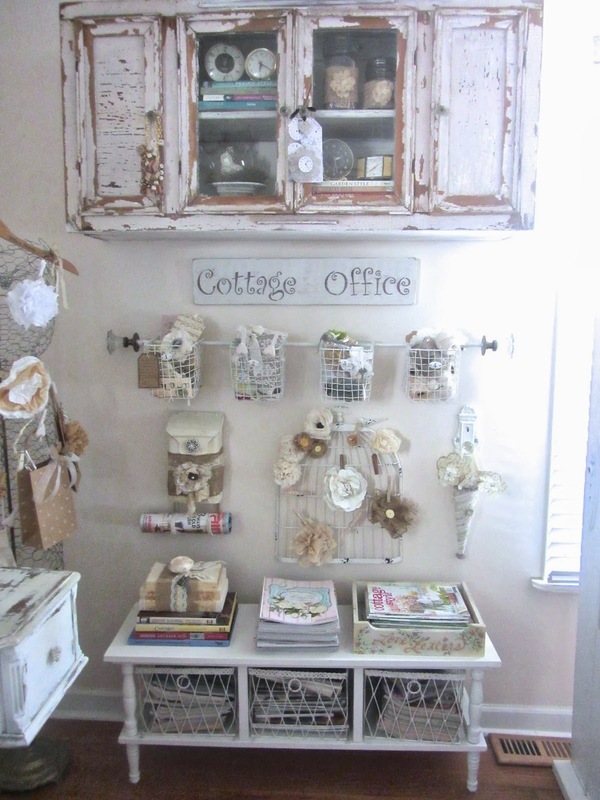 Junk Chic Cottage: Junkin week end and some small office change ups. Hi Everyone. Happy Thursday. Just a post to show you a change ups in my office area. I am heading out tomorrow for a little week end away with the hubby and some Junkin so I am excited. I did a small change up on my mantel for fall. I found my Harvest Blessings sign while digging in my storage cabinet. I dried a few hydrangeas and added them. It is all about storage when you live in small spaces. The area in the back of my dining room was a closet at one time and now is my office. I am not only a door hoarder but a magazine, decor books hoarder too. I need lots of storage for my magazines. This chippy bench I got some time ago and added the wire baskets to fill with magazines. I love to use unique pieces to store things. I have had this hand painted Love Letters box for many years. My husband writes me the most beautiful poems and I had those stored in here for awhile but now I have them in a nice book. So this box is great for storage of my love of magazines!!! I used a curtain rod and hung vintage door knobs on the ends and then fed these little wire baskets through the curtain rod. This gives me visible storage of my tags, ribbons etc. This is one of my all time favorite storage things in my office. This old dress mannequin which is made from chicken wire and hung on an old dress/butler valet from the Hilton Hotel in Chicago 1932. Love this piece. It is a fun visual and a great way to hang important things on. Dress Mannequins make the best storage. This one I actually scored at HomeGoods and I use it to hang my handmade flowers etc. When I had Jane from Blondie's journal over for lunch she brought me this beautiful bird cage memo board. I love it for storage of my flowers. I showed you this a few posts ago. Using wine racks for storage of your magazines. I am such a magazine hoarder that I have to come up with creative ways to store them. This works great and you can actually see each magazine and you do not have to dig through a pile to get to the one you want. This is the old kitchen cabinet I got at the flea market. It was torn out of an old farmhouse they were taking down. I love the chippiness to this cabinet and it hold a lot of stuff. Just a sneak peak of a few doors ( I know shocker that I am showing more doors!!) that are being made into something fun. I am working on this project now and hope to get it completed soon. I cannot wait to show you what they will become. Have a great rest of the week. I am excited to leave tomorrow afternoon with the hubster to our fun week end away. I hope to find lots of treasures to show you. Do not forget to tune in on Saturday for Spotlight. Susan and I have a couple of really special bloggers to have you meet and learn more about. Beautiful.. I too am doing the hydrangea and white pumpkins this year. I am loving all the white little pumpkins and fall neutral flowers too. Have a great rest of the week Gee. Such beautiful rooms and wonderful ideas, as always. Thank you for the tour of your office area. It's gorgeous! I like the little old mailbox on the wall for storage. Great idea! And, I love, love, love that ruffly bag on the dress form. It's so cute! Enjoy your weekend away:) I always love seeing your space it is never cluttered or unorganized. Beautiful. I am love with your office and all the great display pieces. I had my great grandmother's dress form years ago, but someone stole it from my backyard decades ago. I am trying to come up with something as a headboard for our bedroom switch. I still need to have a painting hanging above the bed since our house is an art gallery. But, I got an idea from you just now. I like the curtain rod with baskets hanging. I could have the rod/baskets hanging just above the bed and still have a painting above the rod. You would love my new quilt and shams - pure white! I can't wait to see what you do to the doors...and now it's time to get out my fall decor. Love that dress form! Your office looks really organized! Good for you. I absolutely adore this space! I haven't seen a more beautiful place to create, and there are some really pretty creative spaces out there in blog land. I am definitely pinning your dress forms to my page on Pinterest. I love that your husband writes you love poems and goes junkin' with you. I bet he's a sweetie! 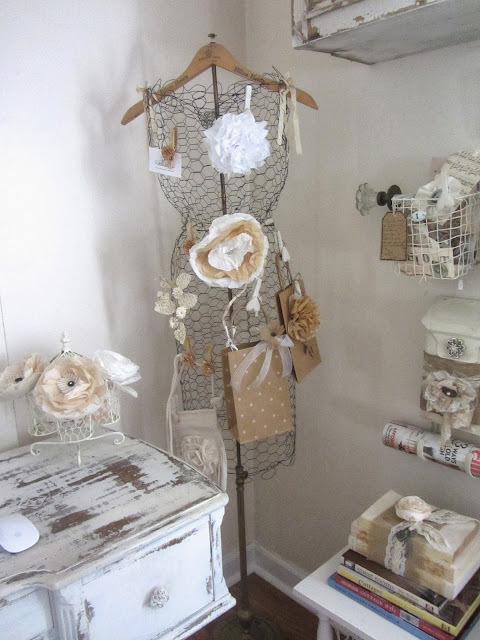 The bird cage, the old mannequin, your handmade flowers, the door...everything is just gorgeous! Love the office space. Have a wonderful weekend with your husband and I hope you find lots of treasures. Can hardly wait to see what your doing with the doors. Hmmm...what could it be? A telephone booth? I can't wait to see what it is! Your home looks lovely as always. Are you perhaps headed to JB? Unfortunately I can't make it this year. Maybe in the spring. Have a good time!! love love love that wonderful door with all the panes, and that Harvest Blessing sign for your mantel, just beautiful!! Have a fun, fantastic time away with Terry and bring back lots of great treasures! Your office is just FULL of so many goodies... I would never get anything done. I'd just be day dreaming and lolly gagging. It's all adorable!!!! To be honest Nancy I do not go back through them very often but I still like to have them. I usually go onto pinterest more so I do not have as many magazines as in the past. For some reason I like to hold onto them and I do on occasion go through old issues for ideas. Have a great Friday and week end. Gorgeous! 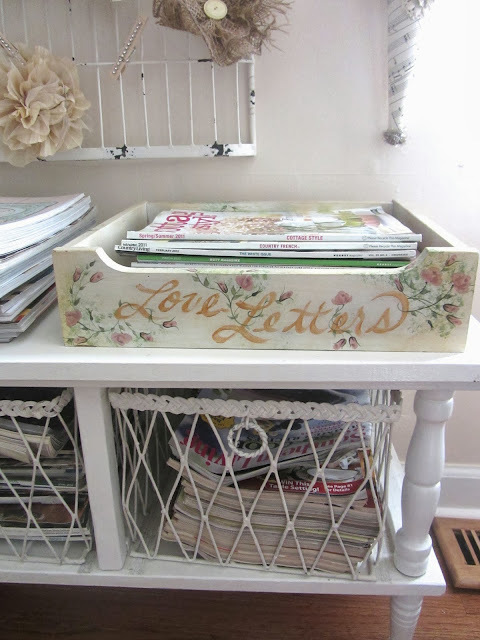 I LOVE that vintage mailbox! Kris, you have the best ideas for storage. I love the mannequins. Especially the chicken wire one. Can't wait to see what you make with the door. Have fun shopping with your husband. So sweet, he writes poetry! 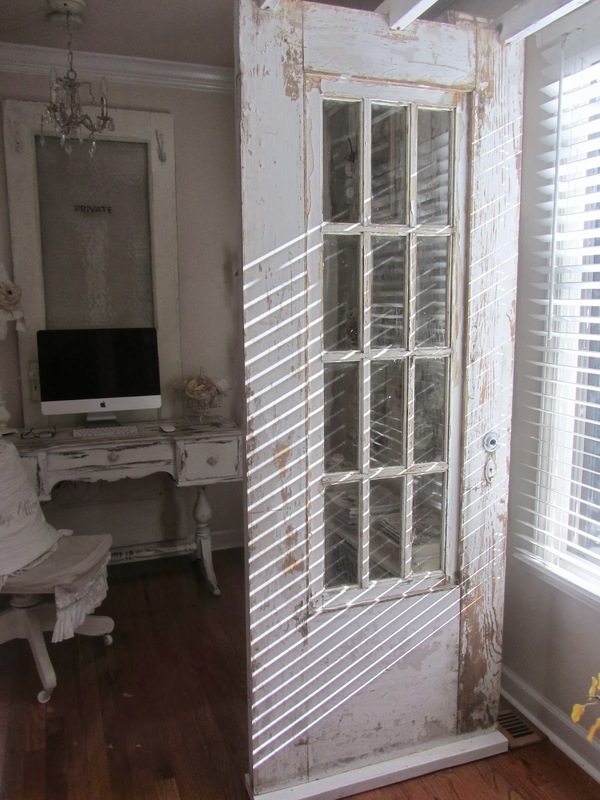 Love that private office door...I agree that it would be fantastic for use as a bathroom door! Kris your office looks fabulous and I love your pretty mantel display! I love your mannequins...both are so pretty!! I have one, but I need to recover her...the fabric is not in good shape anymore. 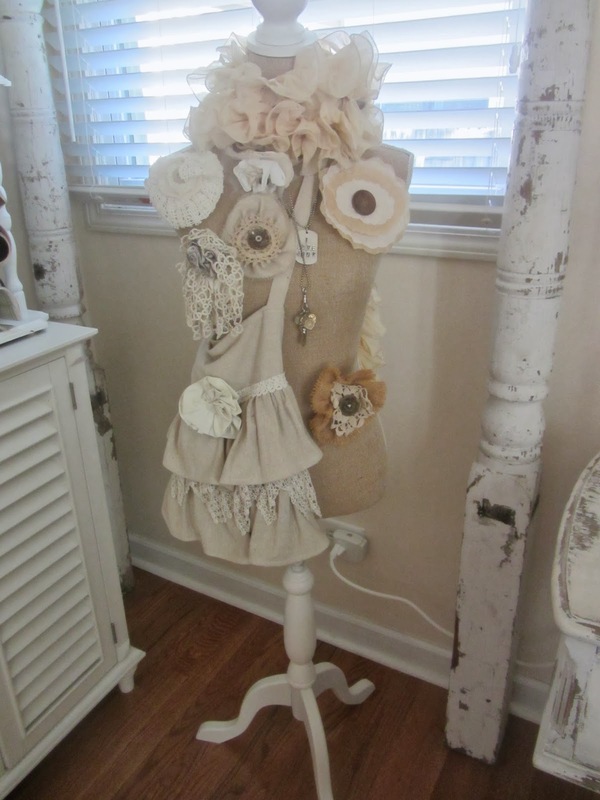 I used this mannequin for years in my booth and I think that taking her to shows did her in. Hope to make her all new again after show season is over. Have a great weekend get away with your hubby and I hope you find lots of good junk!! Such a gorgeous space - I would be inspired just sitting there, truly !!! 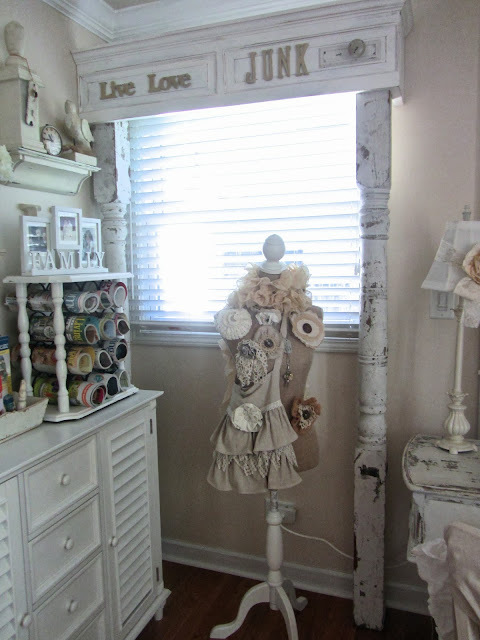 you have gathered such pretty storage ideas, kris--love the room:) the door project likes very interesting already! enjoy your fun weekend!! Oh I love this! 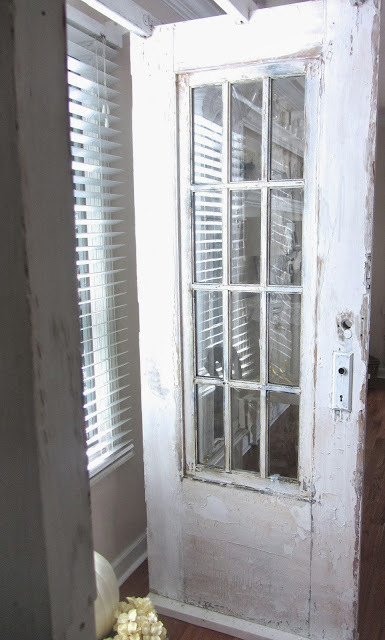 Now I want to go get a door and build a stand for it... lovely inspiration Kris! Love the old kitchen cabinet! Have a safe trip and enjoy the get away! Kris, you would have loved the doors at the auction I went to on Wednesday and they went for a song too! Have a wonderful, wonderful time with your husband this weekend. Sounds like the perfect weekend to me. I have booked my Chicago flight. Kept waiting for the prices to go down. :) We are actually flying in Thanksgiving Day morning. So looking forward to it. I pretty much love everything about this room Kris. 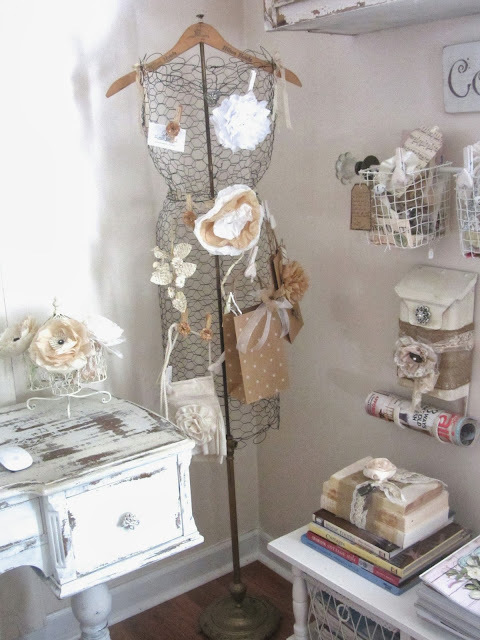 You have such great storage solutions... sooo loving the bird cage memo board, and that chicken wire dress form is amazing!! You've given me some great ideas for my craft room reorganizing. Thanks for the inspiration!! I use a wine rack in my bathrooms to hold hand towels so always ready for guests. Gotta be creative. I love that mannequin. It matches your office so well! You've got some really creative ways to store your things. 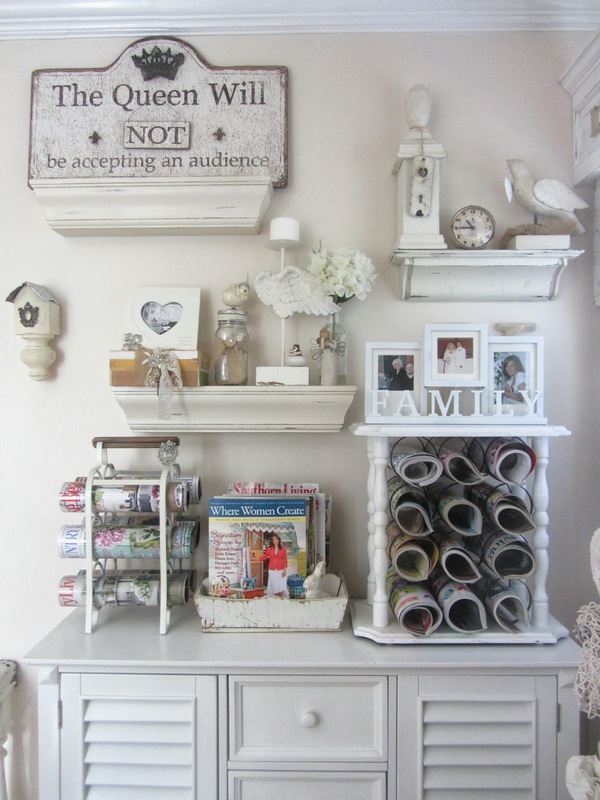 I love the magazines rolled up in the wine rack and the wire dress form. I hope you have a great time this weekend. It is supposed to be nice here this weekend too. I am looking forward to a day of vintage shopping tomorrow. I think it is the largest market in the Vancouver area. I am so excited. Have a great mini vacation with your DH. Kris, I have to tell you when I see your blog in my inbox I truly get excited. I always know that you will blow me away with your creative side. Your office is so amazing and your door hoarding is just fine with me. They are all so beautiful. Love your fall touches too! Have a great weekend shopping!!! OMG! Drooling heaps of your fabulous gadgets. Kris, your office is just darn cute. Love, love all of the chippines! Great ideas for storage. I may do something similar with the rod and baskets. Not a lot of space left in my craft room, but maybe something small. 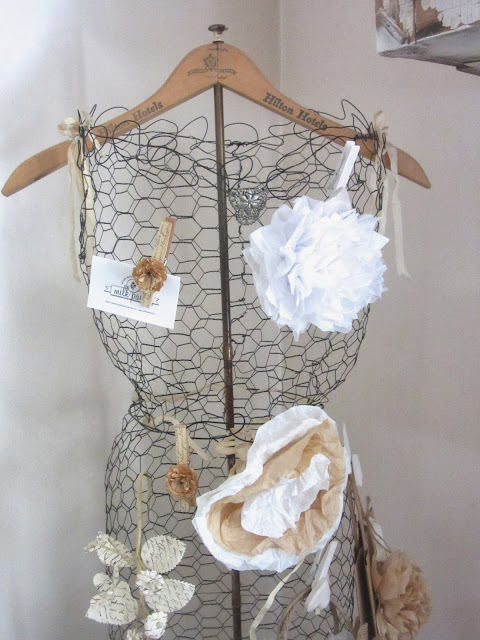 The chicken wire mannequin is such a fun piece and like you say, handy. Have a great get away and bring home treasures! Hmmmm I think I know what that is that you are building. Kris, you already know how much I love your home and this room is beyond gorgeous.... every single element of it!! I'm thrilled to be able to feature your creative space at Shabbilicious Friday today. Kris, love this door can't wait to see what you do with it ... I am sure it will be great! Love this room!